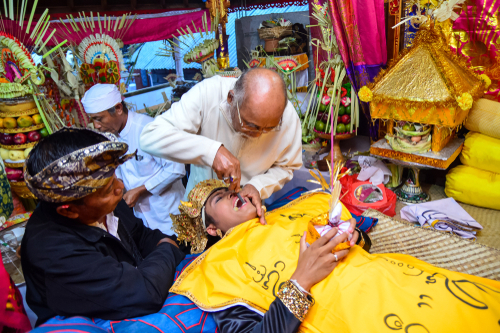 Tooth-filing or metatah is an important Hindu Balinese rite of passage. This very important ceremony is performed for Hindu Balinese when they come of age. Every parent who has a child who has reached adolescence is obliged to carry out this ritual. For a girl it is when she get’s her first menstruation, for a boy it is when the voice starts to change. If parents don’t do it at that time, it should definitely take place before marriage or before death. If a Western women marries a Balinese man, she will need to have a tooth filing done before she can enter the family. For poor families, this ceremony will be sponsored by the government. The Balinese believe that a person’s canine teeth are regarded as an animalistic feature. It is believed that people with canine teethe that have not been filed, may be denied entrance into heaven because they can be mistaken for animals. Tooth are filed to control evil human characteristics, called Sad Ripu that are present in every person and that can lead to unhappiness in life: greed, lust, anger, confusion, stupidity, jealousy, ill-will and intoxication by either passion or drunkenness. If someone dies before having the metatah rituals, his family must perform this ritual before the body is cremated. The metatah ceremony is conducted in the family home by a special priest, and is as lavish as the family can afford. The house is beautifully decorated in colorful textiles, and the candidates dress up. The ritual is often carried out together with other large family ceremonies, such as a wedding or cremation, and often in groups so that costs can be shared. In the actual tooth-filing, the tips of the top front six teeth are filed crosswise so that the teeth are even. This is done by a priest and is accompanied with prayers and offerings. At the start of the ceremony, the child will ask for blessings on both parents. The tooth-filing is performed while the child is lying down on a special high platform made of bamboo and covered by colorful textiles and draperies. Big pillows are there to make the girls and boys feel more comfortable. The attendees wear special dresses with a theme of yellow and white to symbolize holiness. During the ceremony, often the mother holds the feet. At the end of the ritual, the youngster will be given an object to bite representing six flavors: sweet, bitter, sour, salty, spicy, and astringent. This is as a symbol that the child is ready to feel all the flavors that will be experienced in life. The filing also represents the end of the father’s responsibilities to his female children who are now complete. Bali is a lush island to explore full of wonderful nature and an amazing cultural heritage.